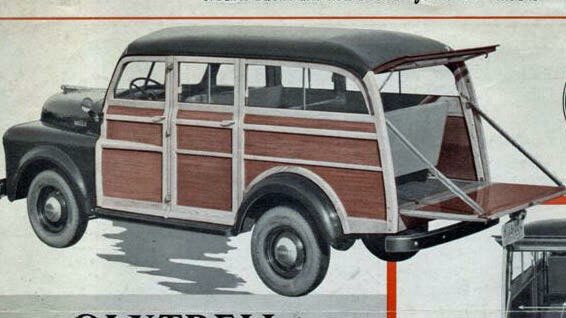 In Part II of the series of the first designer and builder of woodie station wagon bodies, automotive historian Walt Gosden shares his insight on J.T. 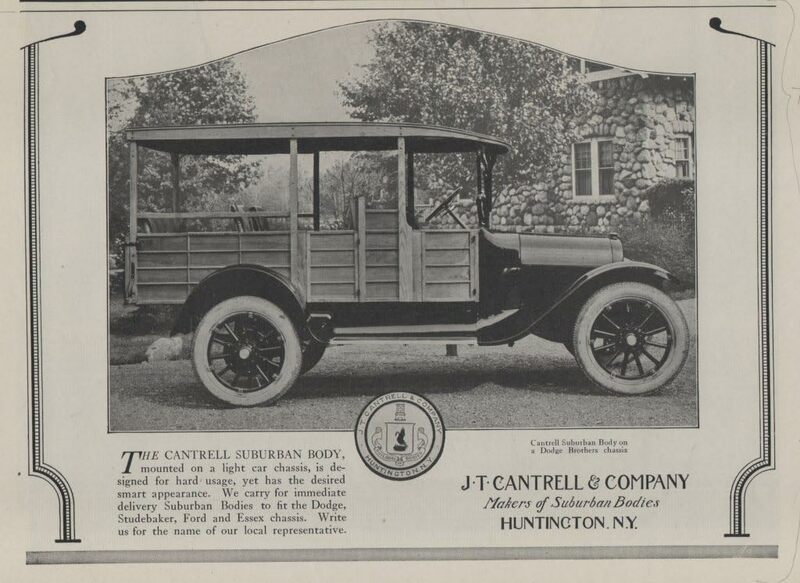 Cantrell and Company of Huntington including rare images from his coachworks collection. 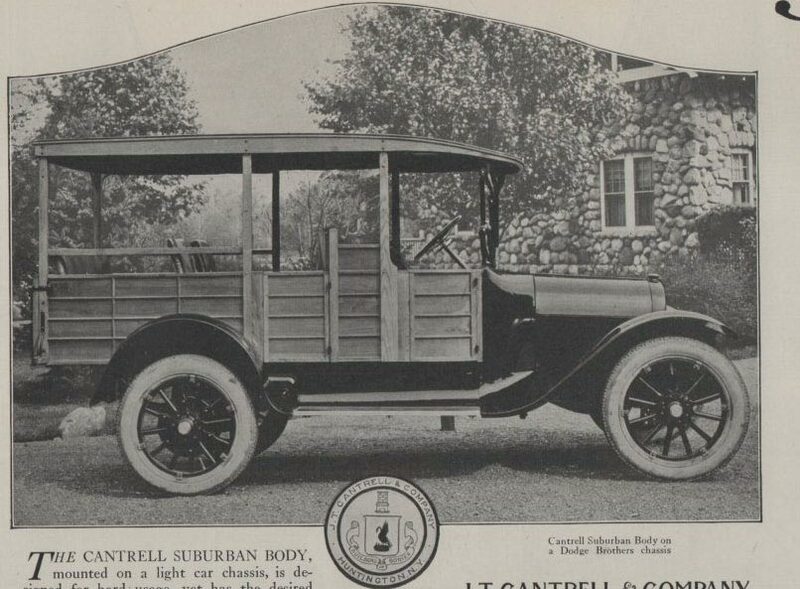 Cantrell sometimes got chassis from the factories to body cars that were complete except for the body as seen in this photo that shows the rear fenders crated and lashed down to the frame above the gas tank, also complete with the cowl and windshield. 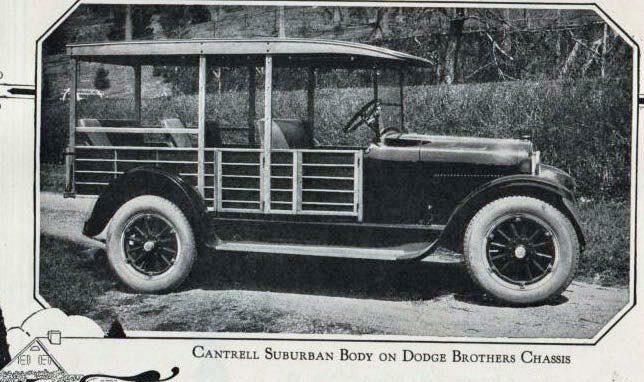 Dodge chassis received the majority of the Cantrell bodies prior to 1940. 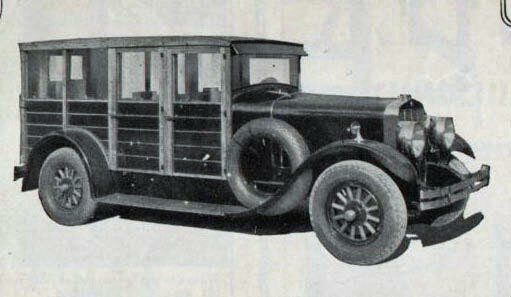 This example is from 1922 and shows the earlier version of their wagon body construction, note the light color of the body panels and location of the "b" pillar. Windshields and cowls were the factory issue components (supplied to Dodge by the Budd Body Co. of Philadelphia, Pa. ) and used on roadsters and touring cars. This is a 1926 Cantrell body on a Dodge chassis. Compare it to the 1922 version. 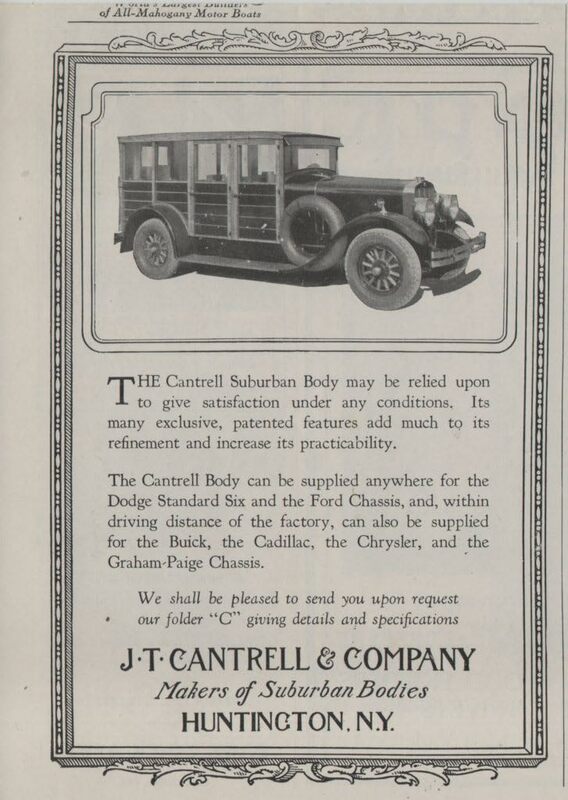 By 1926 Cantrell was using dark body panels and the "b" pillars were moved back. The seating configuration was for 7 people, with clear floor space under all of them except the drivers seat where the toll box was located. 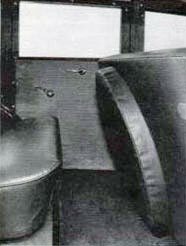 The front and rear seats were bench seats while the center seats were individual with a space between them to allow people access to the rear seat. space with the comfort of a passenger car. The above information I was told by Wilbur Percy, the stepson of J.T. Cantrell back in the early 1970s. 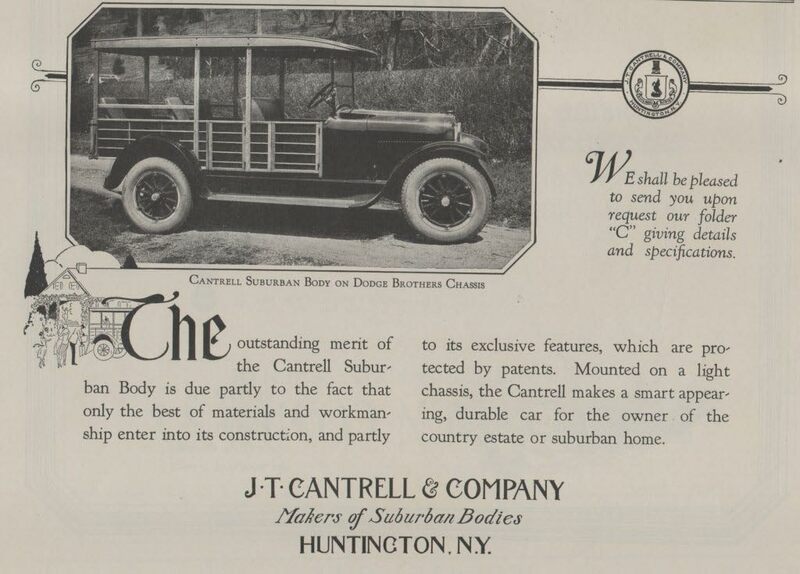 Cantrell advertised its wagons almost exclusively in the Country Life magazine published by Doubleday in Garden City, NY. This advertisement dates from 1930 but the car shown is a 1928 Franklin series 12 B built in the latter part of that year. 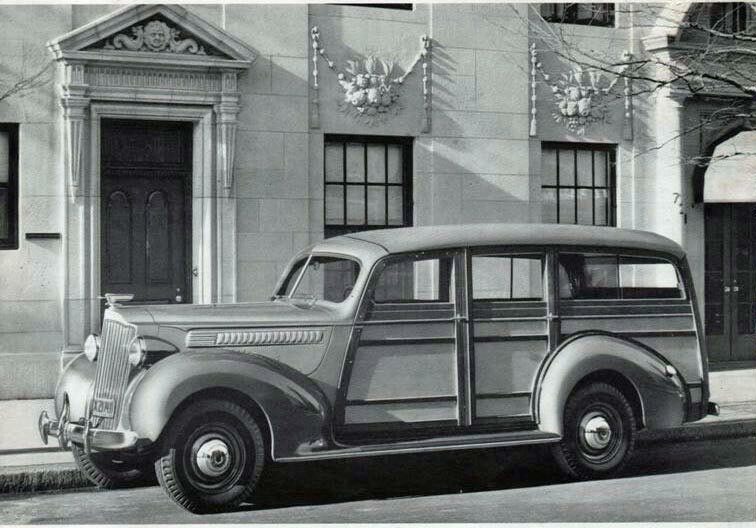 In late 1936 the Packard Motor Car Co. in Detroit, Mi. 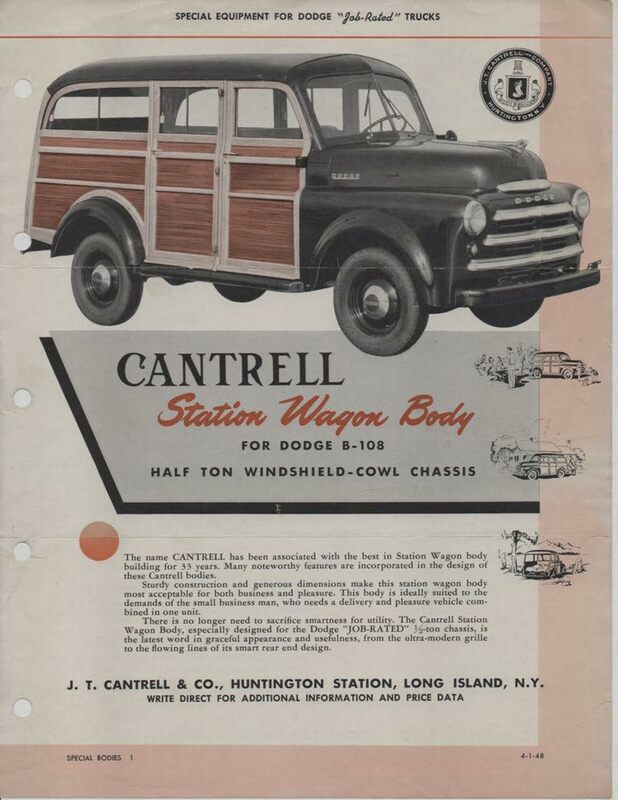 contracted with Cantrell to be its supplier of wood station wagon bodies for its 6 cylinder "110" chassis and 8 cylinder "120" chassis. 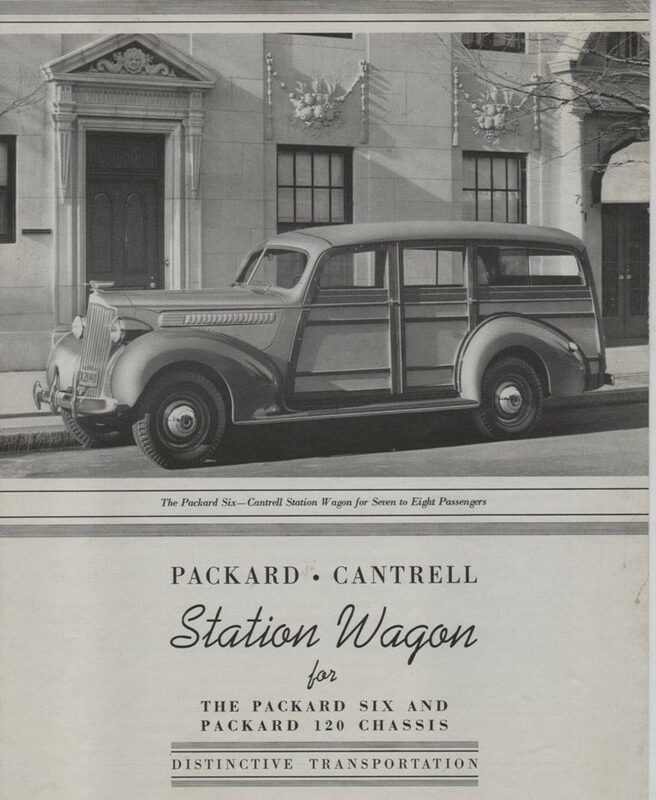 Packard even went to the extent to produce a b & w sales folder specifically for that body style and mentions Cantrell on the cover. This is the most national exposure Cantrell ever received. 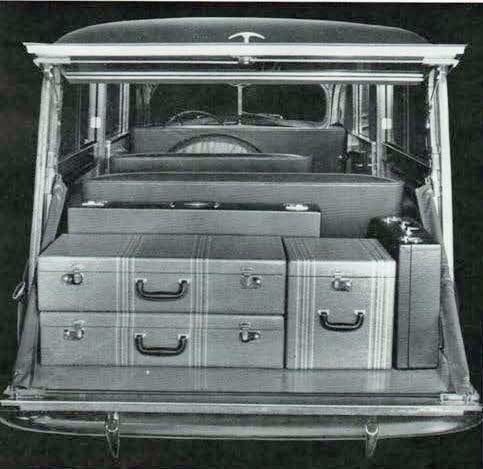 If more space was needed the tail gate could be lowered as shown and a larger carrying platform was available. In the Packard Six- Cantrell station wagon the spare tire and wheel mounted in the back of the front seat. They were covered with leatherette matching the upholstery. 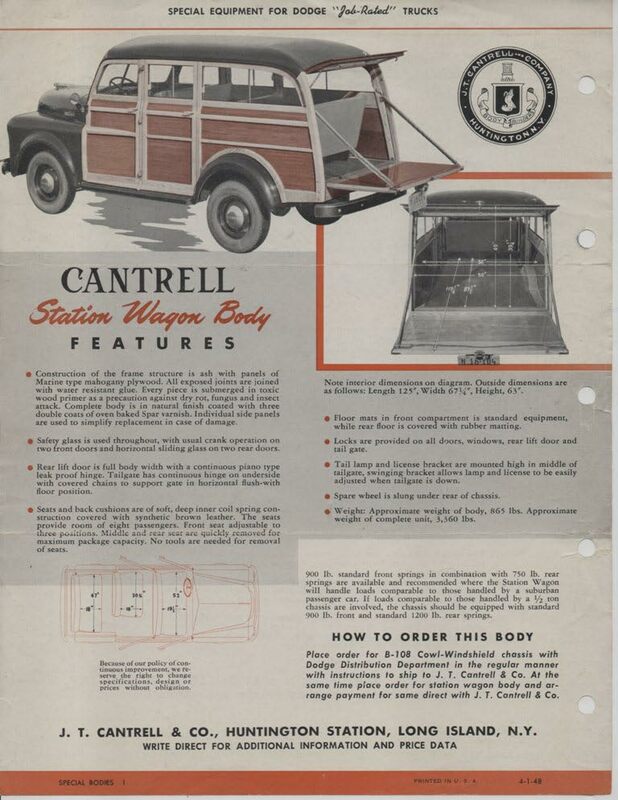 At times Cantrell would order the cars or the factory would send cars with the cheapest body style available ( a business coupe or 2 door sedan) mounted to the chassis - a complete car, and they would cut the body off above the windshield to then build their wagon bodies. They then stacked the cut off bodies out in a near by field, all brand new but minus the cowl/windshield area and the doors. As with the above, this is a commercial truck chassis, postwar most of the Dodge's that Cantrell built were on truck chassis. 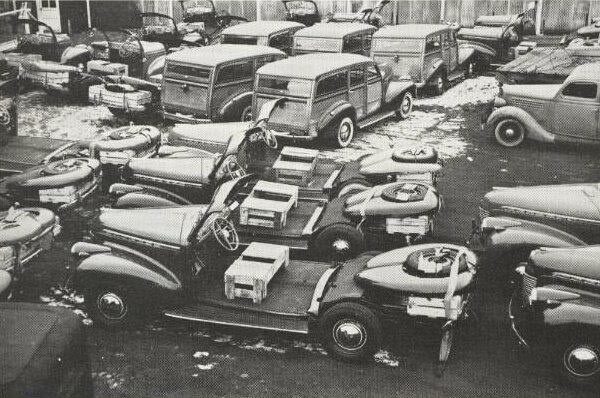 The first photo is a shipment of 1940 cab-chassis cars made at the Terrytown NY Chevrolet plant to use as platforms for station wagons and other commercial vehicles. These were also shipped to the Campbell body company. 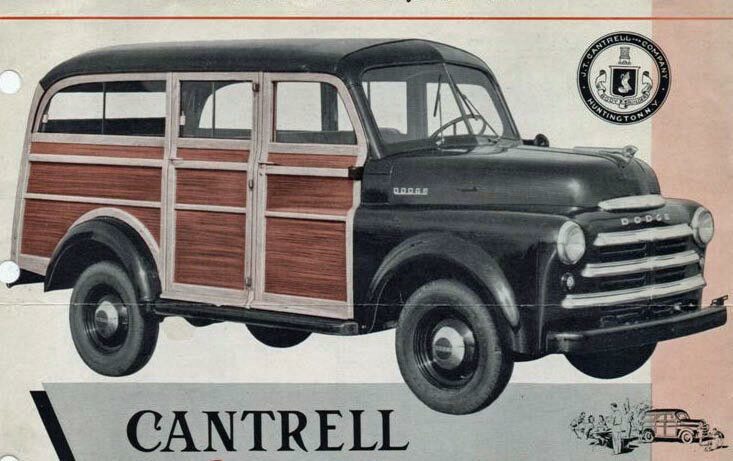 Another major supplier of Chevrolet GM approved woodies. 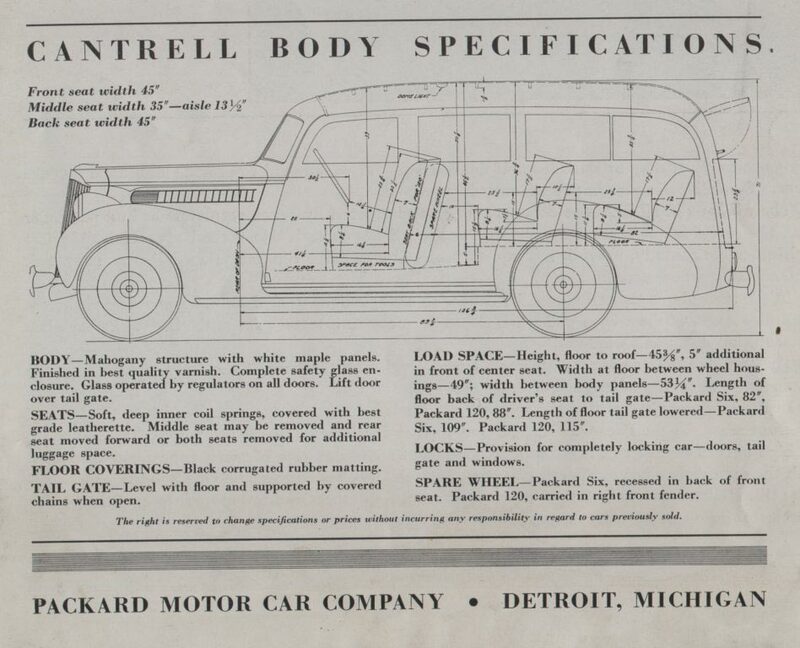 Hudson, Dodge and Studebaker also made units like this for body builders. VERY INTERESTING STORY. I REMEMBER PASSING THE CANTRELL FACTORY LOCATED NEAR THE RR TRACKS OFF PULASKI ROAD IN HUNTINGTON STATION. I REMEMBER ALL THE STATION WAGONS PARKED OUTSIDE. THIS WAS AFTER WW11. I WAS ABOUT 10 YEARS OF AGE. MY HOUSE IN HUNTINGTON IS LOCATED A SHORT DISTANCE FROM WHERE CANTRELL FAMILY HOME WAS . MY SISTERS GIRL FRIEND BOUGHT THE CANTRELL HOUSE AND THEY TOLD OF ALL THE WOOD PIECES STORED IN THE BASEMENT.